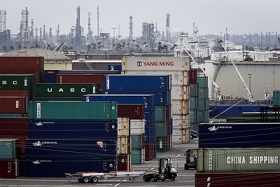 Protracted labor talks have caused massive delays at West Coast ports. Honda Motor Co. will continue to reduce production at plants in Indiana and Ontario next week because of part shortages amid labor disputes at U.S. West Coast ports. Honda said it expected output loss at the factories next week to be around 5,000 cars. But Ohio plants that were slowed last week will be back at full production Tuesday, the automaker said. Honda Manufacturing of Indiana in Greensburg, Ind., which builds the Honda Civic and Acura ILX; and Honda of Canada Manufacturing in Alliston, Ontario, which makes the Acura CSX and the Honda Civic and CR-V, will continue to be affected Feb. 24 to March 2. “Since January, we have been and continue to use a combination of air cargo and special truck shipments to obtain key parts,” a Honda spokesman said. Plants in Alabama, Georgia and Mexico continue to have no impact, he said. Honda reduced production at six North American factories, four of which are in Ohio, between Feb. 16 and 23 for an estimated production loss of 20,000 vehicles. Toyota continues to adjust overtime at some of its plants because of part shortages. “We continue to monitor the situation,” a Toyota spokeswoman said today. Subaru said today production remained unaffected as it airlifts parts.